There are also many other whiskeys produced at this distillery including Hudson Baby Bourbon, Hudson Manhattan Rye, Hudson Four Grain Bourbon, Hudson Single Malt and Hudson New York Corn. Below there is a description of each of these. Hudson Baby Bourbon was the first New York aged whiskey produced since Prohibition and therefore New York’s first ever bourbon. This bourbon is produced with 100% Empire State corn and more importantly this corn is sourced all within a 10 mile radius of the Tuthilltown Distillery. 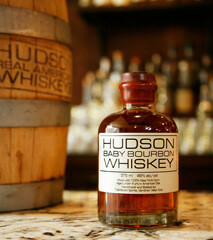 The taste of the Hudson Baby Bourbon is expressively woody, superbly smoky, with mellow notes of vanilla and caramel. Producing the Baby Bourbon is done in a few process. First the corn is harvest and then dried. It is then grinded and then water is added for cooking and the mash is fermenting. It is left to mature in small charred New American Oak Barrels. With using small barrels mean more wood contact which gives the Baby Bourbon its rich, oaky smoky flavour. In the making of Hudson Manhattan Rye the distillery again supports the use of local farming when sourcing the rye required to make Mahattan Rye and 90% of the rye required would be sourced locally, so supporting the local farmers. The method of making this rye whiskey has also brough back small-batch distilling to the state of New York after this method disappear after Prohibition. The taste of this Manhattan Rye is Vibrantly bold, spicy and backwoods rustic, with a smidgen of honey and coconut and in one that has to be on your shopping list if you like your rye whiskeys. Hudson Four Grain Bourbon is the first pot-distilled whiskey to be produced in New York’s Hudson Valley since Prohibition and again about 90% of the grain is produced locally within 10 miles of the distillery. This bourbon has the following characteristics - The soft, balanced richness of corn. The sharp, peppery notes of rye. The smooth subtlety of wheat. And the sweetness of malted barley. This bourbon is matured in small new American oak barrels giving plenty of wood contact during the maturing process and leading to a depth, character and a warm soothing finish. All working in perfect harmony for a rich, full-flavored spirit. Appetizingly balanced, rich and peppery with a comforting warm, soothing finish. 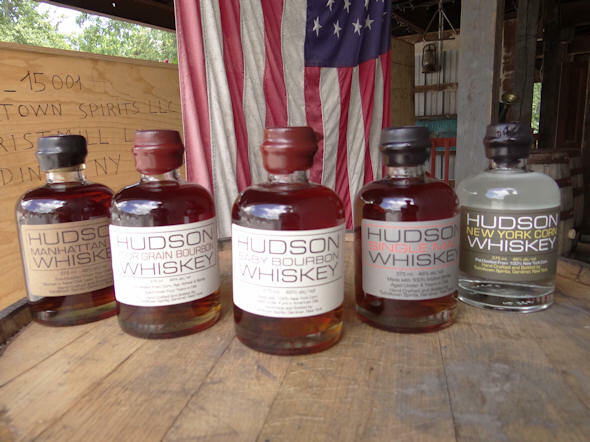 Hudson Single-Malt Whiskey was the first single malt whisky to be distilled in the Hudson Valley and uses 100% whole-ground malted barley and pot-distilled; one small batch at a time in a converted granary at the historic Tuthilltown Gristmill. Once this stage has been completed it is matured in new small charred American oak casks and bottled at 92 proof, preserving its depth and character. The tasting notes for this Single Malt Whisky is Intensely deep, woody character with dulcet tones of vanilla wafer and spice. Husdon Single Malt whiskey is not trying to say the whiskey is like the Scottish or the Irish versions, but are trying to reinvent their own American version. 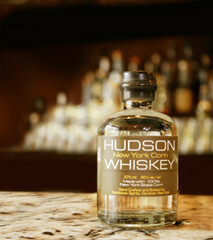 Hudson New York Corn Whiskey is a New York original and one that is famous around the world. It is double distill the corn mash pure and simple with nothing else added. It is also bottled at 46% with no charcoal or chill filtering. This gives the Corn Whisky a crystal clear, silky smooth, creamy and clean drinking experience. So the process is started with Empire State Corn combined with an ancient varietal grown for Hudson and distill it one small batch at a time for a no-nonsense taste experience. After this process the result is a smoothness corn whiskey. This Corn Whiskey is also the foundation of it sister brand Hudson Bourbons. The tasting notes for New York Corn are - Compellingly silky smooth and creamy, yet surprisingly clean, with a symphony of maize.